In a departure from traditional practice, American Eagle Outfitters designed its new automated fulfillment center to handle both store replenishment and direct-to-consumer orders from the same inventory. E-commerce is here to stay. If there were any doubt about that, the more than $600 billion spent online this past holiday season should be proof that consumers like the convenience of shopping anytime and from anywhere. No retailer wants to be left out of the digital marketplace, so most have been steadily increasing investments in their online presence. And as more volume shifts to e-commerce orders, these retailers are adjusting their supply chains accordingly. Such is the case with American Eagle Outfitters (AE). AE is one of the nation's leading apparel retailers, offering trendy merchandise through more than 1,000 stores with its American Eagle and Aerie brands. It also operates a thriving e-commerce business. It filled its first direct-to-consumer orders in 1998 through ae.com and today, serves customers in more than 80 countries. To keep up with steady growth and to adjust to changing retail dynamics, American Eagle is in the process of revamping its U.S. distribution network. Traditionally, it has served stores in the eastern portion of the country from a DC in Warrendale, Pa. (near company headquarters in Pittsburgh), while supplying stores in the west from a facility in Ottawa, Kan. For online orders, the company used a separate fulfillment facility in Kansas. But that's all changing. AE recently opened a new distribution center in Hazle Township, Pa., that's designed to support both stores and online orders. The Hazle facility, which offers easy access to major interstate highways, has already taken over the fulfillment of e-commerce orders; the facility expects to begin shipping store replenishment orders in the eastern U.S. within the next few months. Once the Hazle Township building is fully functional, the Warrendale site will be shuttered. David Repp, vice president of North American distribution at AE, says the driving force behind building the new facility was business growth, especially with increasing volumes in its e-commerce channels. "We needed the infrastructure to support that growth," he says. "We also wanted to get closer to our customers, and it allows us to co-locate our inventory and better optimize that inventory." The decision to combine retail and online fulfillment into one building has its advantages for a fashion merchandiser like AE. For one thing, the company no longer has to maintain duplicate inventories for its brick-and-mortar and e-commerce operations, which holds down carrying costs. But the strategy also presents some challenges. Store orders typically consist of case or split-case quantities, while direct-to-consumer orders usually contain one or two individual items. Because the two types of fulfillment operations require completely different material handling equipment and processes, many retailers elect to separate the operations. In order for its "hybrid" fulfillment strategy to work, the Hazle facility would need automated material handling systems with the flexibility to handle a wide range of orders simultaneously, while at the same time, keeping goods moving swiftly through the facility. To design the new operation, AE turned to Vargo Material Handling Solutions, the same firm that had designed the Ottawa facility. The result was a process that treats the inventory as fully available to both channels at all times. The fulfillment process only diverges at the point of packout and shipping. A key part of AE's fulfillment strategy in Hazle Township has been the elimination of bulk storage. That's a highly unusual move for a retailer, but it was a change that has made inventory more readily available for both distribution channels. In the Warrendale and Ottawa facilities, AE receives trucks of floor-loaded products that it then palletizes for placement into storage racks. At the Hazle Township site, it has dispensed with that process. "Specialized apparel is not a pallet-driven business," explains Repp. "Before, we had to build and then later break up the pallet. But that process is not a value-add to what we do." Instead of being palletized for storage, cartons arriving at Hazle Township are sent directly to the pick modules. For that, the operation relies on a vast network of conveyors (from TGW) and several sortation systems that move cases and totes throughout the 1,000,000-square-foot facility. Without pallet racks, there is no longer a need for lift trucks—in fact, the facility has no powered mobile equipment of any kind. The conveyors take over as soon as goods arrive at receiving. Suppliers provide all shipments floor-loaded within their trailers or containers. Extendable conveyors reach into those trailers to offload the cases for transport to a slat shoe magnetic-driven inbound sorter (supplied by Dematic). The sorter diverts the cartons to conveyor lanes bound for six fulfillment modules. Another divert sends select product to a value-added processing area, where items can be adjusted or re-ticketed as needed. As for the placement of incoming items, the facility's warehouse management system (from Manhattan Associates) dynamically assigns products to one of six fulfillment modules as well as a level within that module. The dynamic assignment helps optimize inventory placement and ensures ready access to all items needed for orders. Each of the fulfillment modules consists of four levels containing static shelving arrayed along both sides of a belt conveyor. Riding on the transport conveyors, products first enter their assigned module at the top floor and then descend to lower levels as needed in a "waterfall delivery" method using vertical reciprocating conveyors. Once the cases reach the assigned level, they are diverted to conveyor spurs that run behind the shelving. The spurs each offer 50 feet of accumulation buffer to temporarily hold products for replenishing the shelves. A worker next removes about a dozen cases from the conveyor and places them onto a cart for transport to an area with open slots in the shelving. The worker chooses a "home" for each case, scanning the case as he or she places it into the back of the shelf location and also scanning the slot's ID to notify the warehouse management system that the stock-keeping unit (SKU) now resides there. Only one case occupies each slot. "Once it is assigned to a location, the product is available to pick and to be sold online," says Repp. All together, the shelving holds 250,000 cases across the six modules. Theoretically, the facility could accommodate the same number of SKUs, since each slot location could hold a different product. As a practical matter, the building typically houses about 50,000 different SKUs. The fulfillment process is designed so that items can be selected for e-commerce and store orders simultaneously. Based on its success using Vargo's Continuous Order Fulfillment Enterprise (COFE) warehouse execution system at its Kansas DC, AE chose to implement it in the Hazle operations as well. AE uses a waveless process, meaning that orders are not grouped into waves as is common in pick operations. Instead, customer orders are entered into worker pick lists on the fly as they are received at the facility—a capability that promotes both fulfillment flexibility and processing speed. Picking at the Hazle facility is directed by radio frequency (RF). To begin the process, a worker scans the bar code on a tote that will be used to gather items. (A number of orders will be picked together into the tote, then sorted later for individual customer orders.) Once the worker scans the tote, his or her handheld device displays the location of the first pick in the sequence, based on an optimized travel path. Upon arrival, the worker selects the item and scans it to confirm the pick has been made. Additional picks are carried out the same way. COFE knows at all times where workers are in their pick sequences. When an order arrives at the facility that requires an item that's in line with the pick path of a current sequence, COFE will automatically assign it to the worker's pick list. The picking process continues until the tote is full or the associate reaches the end of the shelving on that level. The tote is then "closed out" on the RF device and pushed off onto a takeaway conveyor that runs through the middle of the module. When the pick sequence is complete or the tote is full, a spiral conveyor lowers the completed tote to floor level, where it is manually inducted into a crossbelt sorter (supplied by Beumer). 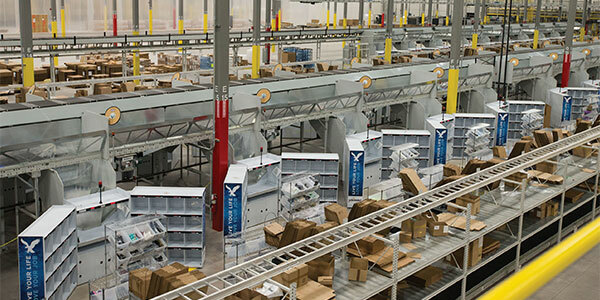 The crossbelt sorts 48 customer orders at a time to bins adjacent to Vargo Speedpack put-wall workstations. The stations feature rows of cubbyholes wired with put-to-light technology to collect products for the 48 orders. The facility currently has 30 such stations, but that can easily be doubled to 60 in the future. American Eagle went with this put system to minimize the amount of time products tie up a sorter bin. "The dwell time with a [traditional] chute system reduces the overall capacity of the sorter," explains Repp. "The cubby system allows us to quickly move the items from the sorter to free it up for more orders." To divvy up products among orders, a worker scans the first sorted item. This causes a light in one of the put wall's cubbyholes to illuminate, indicating that the item should be placed in that cubby. The worker continues to scan selections until all of the items for an order have been gathered in the cubby, at which time the light will remain illuminated to show that the order is complete. The associate then removes the items and places them into a tote on a wheeled cart. The cart is ferried to one of the three adjacent pack stations that service each put wall. At the pack station, a worker removes each item from the tote, scans it, and determines whether to pack the order in a box or a bag. The container is sealed and a shipping label applied. Completed parcels are then placed onto a takeaway conveyor for transport to another crossbelt sorter that feeds shipping docks by carrier type and transit mode, such as air, next day, ground, and so forth. Later this year, retail fulfillment will transition from Warrendale to the Hazle DC. The process for filling retail orders is similar to the e-commerce fulfillment process, with slight differences. Both types of orders are filled within the modules. For store orders requiring full cases (such as store openings or new product introductions), RF coordinates the picking of cases from the shelf directly to the conveyor belt in the module. As a case is selected, a shipping label is applied. Store replenishment uses the same open case inventory that's used to fill e-commerce orders. Again, the picking process is directed by RF, but different totes are used for gathering the retail orders. Like e-commerce orders, these are picked on a waveless basis. Completed totes are pushed off onto a takeaway conveyor. However, the retail totes are then diverted to a separate put-to-light area instead of being sorted with the crossbelt unit. The put-to-light system (supplied by Dematic) has space to stage 3,500 cartons used for gathering store orders. Each carton will ship to only one store. Once the totes arrive in this area, a worker at the station removes each item and scans it. This causes a light adjacent to the put carton to illuminate, indicating that the product is needed by the store associated with that carton. The associate places the item in the carton and hits a button to confirm the action. This continues until either the order is complete or the carton is full. The carton is then sealed, labeled, and pushed off onto a takeaway conveyor. The conveyor feeds a small sliding shoe sorter that diverts products to linehaul carrier lanes for store delivery. When fully operational, the Hazle DC will service between 450 and 500 stores. American Eagle Outfitters expects that the new shared-inventory system will shave operating costs by 10 to 15 percent. The facility will save further on energy use though the implementation of low-power conveyors that shut off when product is not present, as well as efficient lighting that reduces electricity use. The facility is in the process of obtaining a LEED (Leadership in Energy & Environmental Design) certification from the U.S. Green Building Council. The Hazle Township facility is space-efficient as well. While the DC is expected to handle the same volumes as its sister operation in Ottawa, it won't require as much square footage to do so. The Vargo-designed system has allowed it to fit into 20 percent less space than that occupied by the Kansas building, which provided significant savings. Once fully operational, the new facility should see even greater efficiencies of scale. The automated system assures that it can easily handle the fluctuating volumes associated with a seasonal business such as apparel. And just as fashions change, so do order patterns; no one knows for sure how volumes will grow for each channel. But now, AE is prepared with the distribution flexibility it needs to remain a force in the fashion market.